Because of Microsoft´s failure to develop a simple and effective email spam filter for Exchange, many businesses are looking beyond Microsoft´s portfolio of products to find a better email filter for Exchange. Some businesses have had pleasant surprises. Not only are many software solutions easier to use than the built-in spam filter for Microsoft Exchange, they are often more effective at identifying spam, and many of the paid-for features in Microsoft´s Exchange Online Protection packages are available free of charge. For a business looking to enhance its online security, looking to implement a solution with a low maintenance overhead, and looking to save money, spending the time to evaluate alternatives to the built-in spam filter for Microsoft Exchange can be time well spent. What are the Problems with the Spam Filter for Microsoft Exchange? The problems with the spam filter for Microsoft Exchange vary according to who you speak with. Some businesses complain about the volume of spam the filter fails to detect. Others complain about the advanced technical skills required to find the filter´s optimum configuration. These two problems are not disassociated. If you are receiving too much spam, it is a natural reaction to increase the Spam Confidence Levels. This can have the result of delaying the delivery of business-critical emails – particularly sales leads – while they wait to be extracted from quarantine. The reaction to this scenario is to reduce the Spam Confidence Levels, with the result that more spam evades detection. Although it is possible to apply different Spam Confidence Levels to different departments, the least labor-intensive way of doing this is (by synchronizing the spam filter for Microsoft Exchange with directory software) is a paid-for extra. Paying extra for Exchange Online Protection does not necessarily resolve the problems with the spam filter for Microsoft Exchange. Spam detection rates are still low by industry standards, and the more features you pay for, the more you have to configure to find the optimum Spam Confidence Levels. Microsoft has tried to increase the spam detection rates of its email filter for Exchange. Back in 2015 it introduced a feature called “IP Reputation” – a feature that was described as a “sophisticated version of Greylisting”. Although it was free, IP Reputation only succeeded in increasing false positives. Had Microsoft simply introduced Greylisting as an optional feature, businesses could have had the choice of whether they wanted higher spam detection rates at the cost of slightly longer email delivery times and white-listing trusted senders. Microsoft´s customers were not given the choice, and many have since implemented a third-party email spam filter for Exchange with the Greylisting feature. Greylisting – with spam detection rates of 99.9% – is only one of the features businesses should look for in an email filter for Exchange. Many other features exist that can enhance online security, and these are usually factored into the cost of implementing an effective email filter for Exchange. One of the most important ones is SUBRL filtering. This process checks links within emails against lists of URLs found in unsolicited emails. SUBRL filtering significantly reduces the likelihood of a successful phishing attack, and thereby reduces the threat from malware and ransomware. Another feature to look for in an email filter for Exchange is outbound scanning. Outbound scanning is provided by Microsoft as a paid-for extra if your business uses Office 365; but most third-party software vendors include this feature – which can identify compromised business email accounts and prevent your business´s IP from being blacklisted – as standard. SpamTitan´s email spam filter for Exchange is the ideal filter for businesses looking to enhance their online security with a low maintenance solution that saves them money. 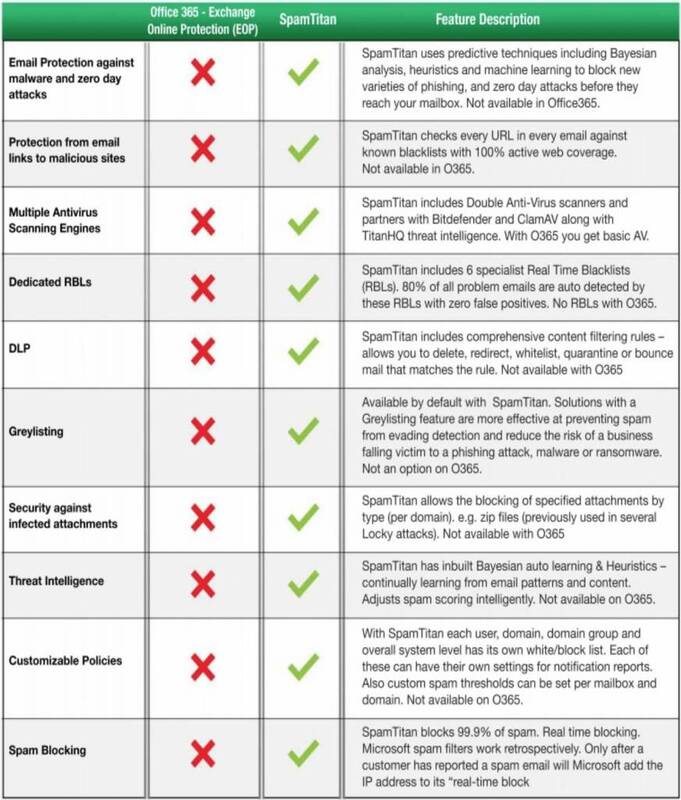 Packed full of optional features that can be activated or deactivated with the click of a mouse, SpamTitan achieves spam detection rates of 99.97% (with a false positive rate of just 0.03%) at a remarkably low cost. With SpamTitan, you are not restricted to a cloud-based anti-spam service. Our email spam filter for Exchange can be deployed as an on-premises virtual appliance and managed via a centralized administration portal. Directory synchronization, Greylisting, SUBRL filtering and outbound scanning are supplied as standard, with no limit on the amount of mailboxes SpamTitan can protect. Subscriptions for SpamTitan vary according to the preferred deployment option and payment cycle. 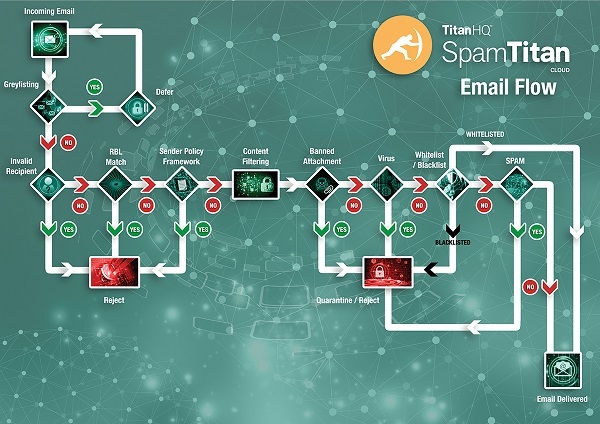 Typically most businesses pay less than $10.00 per employee per year for enhanced protection against phishing, malware and ransomware; but before you decide whether this represents value for money for your business, you are invited to try SpamTitan´s email spam filter for Exchange for free. It was mentioned above that spending the time to evaluate alternatives to the built-in spam filter for Microsoft Exchange can be time well spent, and it should not take you long to determine whether or not SpamTitan is a superior produce to the built-in spam filter for Microsoft Exchange. From contacting us in order to request your free trial of SpamTitan to implementing our email spam filter for Exchange takes less than an hour. However, we will give you plenty of time to evaluate SpamTitan in your own environment so you can do a like-for-like comparison with Microsoft´s email filter for Exchange. To find out more about our invitation to try SpamTitan´s email spam filter for Exchange for free, or to ask any questions about its features, do not hesitate to get in touch. Our team of Sales Technicians will be happy to answer your questions and will guide you through the process to begin your free trial of our email spam filter for Exchange. You can enhance the security of Microsoft Exchange and significantly improve your defenses against spam, malware, ransomware, and phishing attacks by applying an advanced email spam solution on top of MS Exchange. SpamTitan uses predictive techniques to block new malware variants, phishing, and zero-day attacks to prevent them from being delivered to end users’ inboxes. MS Exchange, like most email services, only has rudimentary spam detection capabilities. A third-party email spam solution such as SpamTitan will increase spam detection rates considerably. Without an additional spam filtering solution, organizations are likely to continue to have spam and malicious emails delivered to employees´ inboxes. Microsoft Exchange and Office 365 incorporate security features to block spam and phishing emails, and those features are improving. However, organizations that are used to dedicated security solutions are likely to find Microsoft Exchange and Office 365 antispam security options to be insufficient. SpamTitan uses SURBL filtering and malicious URL detection mechanisms to analyze each incoming email, which greatly improves detection of spam and malicious emails. The combination of two AV engines ensures that malware and ransomware in email attachments are detected and quarantined before they can do any harm.